2nd edition Kickstarter bundle. NIS. "All 20 Yomi decks + EX Powerup. 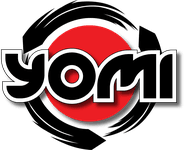 Get all 20 Yomi decks months ahead of the normal release PLUS the EX Powerup set. Contains oversized Dragon card for 2v1, premium knockdown token, and special edition EX cards to make characters hilariously overpowered.)"